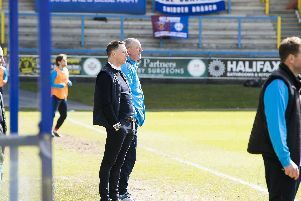 Town boss Jamie Fullarton described his side’s 2-1 defeat at Salford as a “learning curve” as Halifax suffered their first defeat of the season. Adam Rooney struck in the 82nd minute to seal Salford’s first win of the campaign after Matty Kosylo had levelled for Town following Rooney’s early opener. Fullarton called Rooney’s winner a “sucker punch” after his team worked hard to get back into the contest. “Sometimes the scoreline doesn’t reflect the endeavour, effort or even opportunity, because it was an opportunity tonight, to get something from the game,” he said. “The one thing I haven’t been able to doubt is that they go to the well, and they continue to on a game-by-game, day-to-day basis. “They go maximum in the attitude and application we demand. There’s no doubt that every one of those players who were involved tonight provided that, and I think that’s when you’re disappointed for the group because they got themselves back in the game and then the sucker-punch. Town went close through Dayle Southwell and Jonathan Edwards during the match, and Fullarton felt they did enough to warrant at least a point. He said: “The standards are set by the players on how they perform, both last season and this season. “Whilst we weren’t at our best tonight in certain aspects, that’s something we can work and make sure we do better. “We created enough chances to take something from the game, if not all the points. Fullarton was also pleased with how his side handled Salford’s attacking threat. “We’re looking to go and win every game that we play,” he said. “Sometimes when you’re like that you’ve got to make sure your structure and organisation limits them, which I felt we did. Fullarton handed a debut to midfielder Simon Lenighan, whose signing was only announced shortly before kick-off. “I thought he contributed well,” Fullarton said of the former Rotherham and Leeds player, who also played one game in a loan spell at Halifax in February 2014. “If you look at how we play and what we are, I think Simon’s attributes are something that will add value to how we’re going to play. “When you’re looking to bring players in, you’re looking at how they interact with the group in the dressing room and what they add value to on the pitch. “When you’re piecing things together as a manager and understanding what you have on the pitch, then it’s complementing and supplementing that, and I thought he did that very well. “The importance is that you understand what players you bring in and what they can add value to and how you look to manage them. In 2015, Lenighan pleaded guilty to assaulting three women on a night out in Harrogate, and was given a community order for 12 months, including 150 hours of unpaid work. “The club is fully aware of Simon’s past and I know he’s extremely remorseful and has been held accountable for his mistake - we’re here to focus on the now and how we continue with the momentum we’ve already built with our performances so far this season,” Fullarton said.